Mining in booming in Mexico and especially along the Sierra Madres in the country’s arid north. Sonora is leading this boom – accounting for 29% of total production and with more land covered by federal mining permits than any other state. But it wasn’t the boom in mining that first drew state, national, and international attention to Sonora’s mining industry. 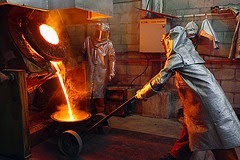 Nor was it the massive expansion over the past decades of the mining and metallurgical operations of Grupo México – the country’s mining giant – that sparked scrutiny of the company by congressional committees and environmental organizations. The mining boom that is taking hold of eastern Sonora was largely ignored because it took place in some of the state’s most remote and least traveled regions. It wasn’t the boom, then that woke up Sonora – and other mining states – to the dangerous and unregulated mining operations sweeping northern and north-central Mexico. Rather it was the dramatic mining bust of August 6, 2014. That’s when 40,000 cubic meters of orange toxic wastes burst out of the tailings pond of Grupo México’s immense copper mine near the border town of Cananea. 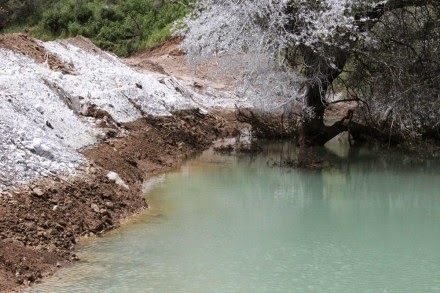 Only after the tailings pond of the Sonora’s largest mine burst open did Sonorenses and the Mexican public begin to consider fully the environmental consequences of virtually unregulated mining in Sonora – and across the nation. About near the Arizona-Sonora border, an earthen dam holding back an immense tailings pond burst open and a flood of toxic copper sulfate acid came rushing down the Sonora River valley. This wave of toxics from Grupo México’s huge copper mine in Cananea washed down one of the most beautiful river valleys in Mexico. The flood of toxics – including copper, arsenic, aluminum, cadmium, chromium, manganese and lead -- poisoned more than three-hundred water wells throughout the river valley, leaving more than a dozen of small riverside towns without any water – no water to drink, to bathe with, to irrigate crops, or to give their cattle. Like Sonora’s other major rivers – Yaqui and Mayo Rivers – the Sonora River hasn’t been a free-flowing river for more than five decades. Two dams that block the river flow: El Molinito (completed in 1991) dam 23 kilometers north of Hermosillo and the older Abelardo Rodríquez dam (completed in 1962), which rises on the city’s eastern edge. Designed to capture water for agribusiness, the two dams and their reservoirs later became Hermosillo’s last best hope to quench their rising demands of the booming urban population and the city’s expanding industrial sector, including the Ford automobile factory. The dams prevented the flood of poison from entering the city and from contaminating its wells and canals. The National Water Commission (Conagua) halted the release of water from the El Molinito reservoir because of dramatically increased levels of contamination. During the past three years, the Yaquis and other members of the movement to oppose the Novillo-Hermosillo aqueduct, along with Conagua, had been advocating that Hermosillo make increased use of the water captured in El Molinito, particularly in wet years and after major rain events in the valley. However, For Hermosillenses, the upshot of the environmental disaster that struck the Sonora River Valley was to confirm their conviction that only by tapping the Yaqui River would the city have access to the quantities of clean water is so desperately needed. The environmental disaster served as a belated wake-up call for Hermosillo about the quality of water flowing down the Sonora River. There was increased awareness that all water flowing down the river valley from Cananea is likely to be contaminated to some degree by mine wastes, as numerous studies prior to the environmental disaster have noted. Grupo México’s Buenavista mine – the world’s fourth largest copper mine – spreads out next to the stream that feeds the Bacanuchi River, which is a tributary of the Sonora River. Whatever toxics seep or overflow into the Bacanuchi Sonora River and its underlying aquifers and river basin. The Sonora River Valley was once the major inhabited area in what is now Sonora. The towns – most bearing indigenous names such as Arizpe, Banámichi and Aconchi -- that are stand on the gravel terraces overlooking the river and its floodplain date back to the 1630s when the Jesuits established missions among the Opata and Pima Bajo communities that thrived along the Sonora River. If there were no Sonora River, there would be no Hermosillo. What now worries Hermosillo is the city could revert to desert if alternative water sources are not found. The Sonora River flows southwest through the Sonora River Valley. Near the river’s confluence with the smaller San Miguel River, a small group of Pimas settled, farming the floodplain. The Spanish established a presidio here as part of their campaign to crush the Seri resistance. Around this Spanish fort and indigenous settlement, the town of Pitic gradually formed. Increasing commerce from the north-south traffic along the wagon road through the desert and the rising importance of the port city of Guaymas to the south gave Pitic a new importance as a trading center. In 1828 the Mexicans renamed the town Hermosillo. But it was until 1879 – shortly before the completion of the Sonoran Railroad -- that Hermosillo became the new capital of Sonora. From its origins, Hermosillo has been dependent on the Sonora River and the water basin created by the river as turned west through the Costa de Hermosillo before finally disappearing into the coastal plain. The viability of new commercial center (based initially on marketing produced from eastern Sonora) and the agricultural region to the city’s west, north, and south has been integrally linked to the Sonora River. As the river’s flows diminished because of over-allocation and rapidly rising urban water consumption, both the city of Hermosillo and area farmers began recklessly drilling for water in the river delta. In the 1950s the Costa de Hermosillo region became one of Sonora’s leading agricultural regions. Since the 1980s, however, agribusinesses have abandoned large expanses of previously irrigated desert as the Sonora River dried up and as salt water began leaching from the sea into the depleted fresh-water aquifers. Over the past three decades, pressure has been mounting to find new sources of water to quench the thirst of the municipality’s residents, agribusiness, and the city’s new industrial sector. Initially, damming the Sonora River provided some assurance that Hermosillo would have a dependable supply of water. The Abelardo Rodríguez dam and reservoir (completed in 1962) rose on the city’s eastern edge, and the smaller El Molinito dam and reservoir started capturing water from major rain events in 1991. However, the Abelardo Rodríquez reservoir turned into a dusty bowl in 1996-97, precipitating proposals to transfer water to the city from the Yaqui River. Over the past two decades, the level of El Molinito reservoir has also dropped dramatically as a result of drought and over-allocation of water resources in the Sonora River basin, including by Grupo México’s expanding mining operations.